My children are huge fans of bath time, they would quite happily stay in the tub even when the water has gone cold, lots of wrinkly hands and feet to be seen when they finally jump out of the bath. The girls were thrilled when some new goodies turned up from Kids Stuff Crazy Soap. 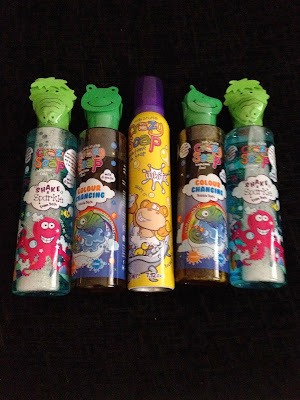 Kids Stuff Crazy Soap has been delivering bath time fun for over 20 years, I can't believe it has been that long!! The idea behind the company was to take the stress out of bath time because not all kids love floating around in the bath like mine do. Always introducing new products to their range, Kids Stuff Crazy Soap injects a touch of creativity and a splash of fun to your childs normal washing routine. Each product comes in lovely bright and fun packaging, immediately grabbing my children's attention. Each product has a different animal character on the bottle as well. 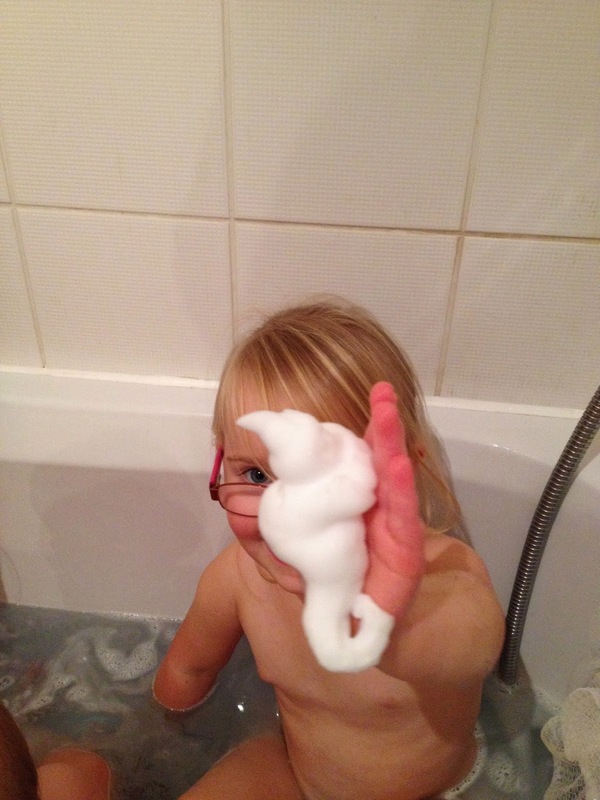 The foam bath and the bubble bath each came with a foam finger puppet popped on top the lids, adding an extra thing to do whilst in the bath. The trouble we had was deciding on which one to use first. In the end we all agreed that we wanted a bit of sparkle added to the bath. When you shake the bottle, you see lots of glitter swirling around inside and this glitter is really noticeable when the foam bath is run under the water. Whilst enjoying the bubbles, we decided to try out the bath time fun saop too. 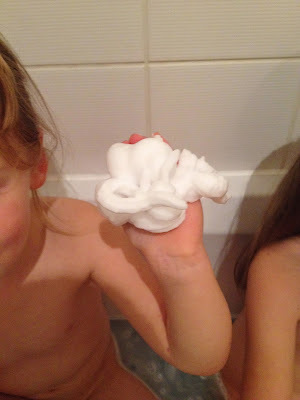 The idea is simple yet effective, squirt some soap into your hands and then mould it into whatever shape you want. Freya said that she made a snail and then Gracie all be it by accident actually managed to make a seahorse. And of course the great thing is, is that once they have finished making things with the soap, they can then use it to clean themselves after too. 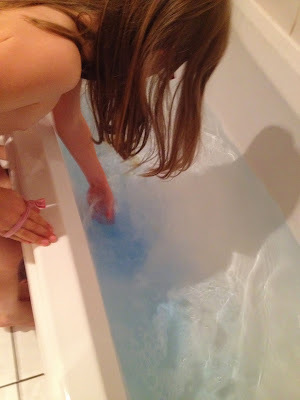 The girls were more than eager for bath time the next night, excited to see the magic of the colour changing bubble bath. You pour the bubble bath into the bath after the bath has been run. 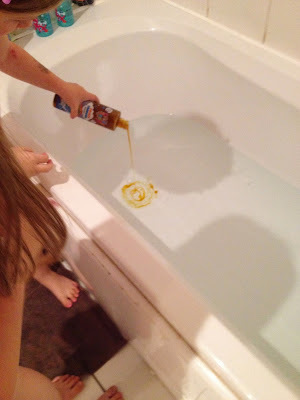 Then swishing it around in the water, watching the liquid change from orange to blue, very clever and the best for thing for us parents, it doesn't stain the bath at all. My only complaint with this one is that the name is a bit deceiving because it says bubble bath but there were no bubbles. Overall these products were a big hit. Reassuring for us as parents is the fact that all their products are made from a PH balanced formula making then both mild and gentle, perfect for even the most sensitive of skin. And for the kids it makes bath time that bit more enjoyable, creating a new adventure each time they jump in the tub. You can find Kids Stuff Crazy Soap on both Facebook and Twitter, keeping you up to date with all their latest news. my kids would love this, especially the foam! Wow this looks like so much fun, my little ones would love these.